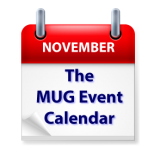 This week’s MUG Event Calendar is highlighted by a visit by Bob “Dr. Mac” LeVitus to a group in his home state of Texas following his successful Mid-Atlantic MUG Tour last week. A creative pro group in Massachusetts will discuss creating music videos, a group in Arizona will look at health and fitness apps, and a California group will look at El Capitan. Other topics on the week’s agenda include Swift, syncing, iPhone 6S Plus, backups and more. San Gabriel Valley Macintosh Users Group – Ready for Christmas/Hanukkah?